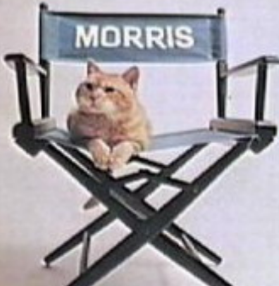 Who is America’s best-known cat? 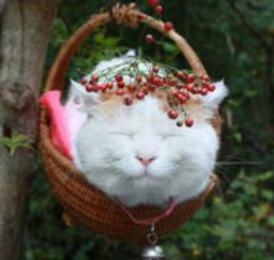 Leaving aside fictional felines like Felix, Garfield, and the Cat in the Hat, the answer might be the unusual-looking Grumpy Cat, whom you may have seen online, sometimes featured with humorous captions. Grumpy Cat What a sourpuss! 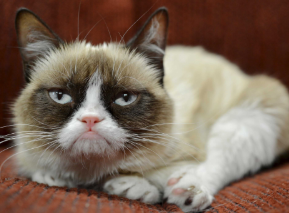 Actually, Grumpy Cat (real name Tardar Sauce) only looks grumpy— her appearance is caused by an underbite and feline dwarfism. She was born in 2012 and has been featured in advertising—she even has her own webpage, licensed merchandise, and social media presence. Lil Bub There is also Lil Bub, another current celebrity cat who starred in a 2013 documentary called Lil Bub and Friendz, which won the Tribeca Online Festival Best Feature Film award. 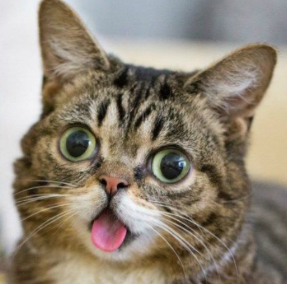 Like Grumpy Cat, Lil Bub has a distinctive appearance caused by feline dwarfism. Socks Then there are the cats who have gained some measure of fame because they were presidential pets. 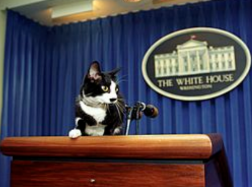 While dogs have historically been more common as pets at the White House, there have also been cats who became popularly known, such as Socks (Bill Clinton), India “Willie” (George W. Bush), Shan (Gerald Ford), and Misty Malarky Ying Yang (Jimmy Carter). To see more weird and wonderful cats who have taken the internet by storm over the past ten years or so, check out boredpanda.com.